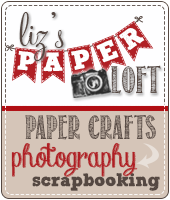 Liz's Paper Loft: MCT What a Treat Wednesday ~ for you! 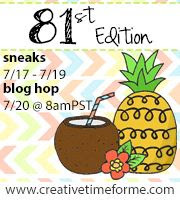 Hey hey hey it's What a Treat Wednesday over at My Creative Time! 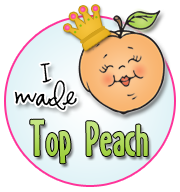 I love it when I'm scheduled for "what a treat" day, since it gets me to think of new ways to create little "favor/gifts" for someone. It's also fun to see what the other girls have come up with...let me tell you, some of the girls are just MASTERS in this area! 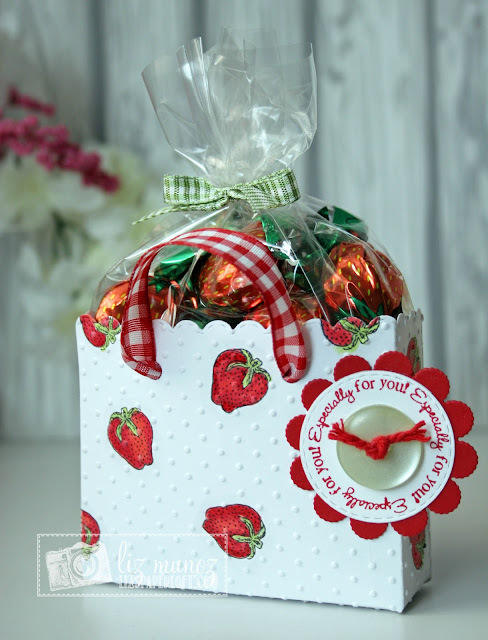 My project today is a fun little bag filled with strawberry candies...so of course I had to add strawberries to the bag. The first thing I did was randomly stamp the image then color with copic markers. I should say I quickly colored the images, as you can see I wasn't overly careful with my coloring. I assure you that in person you can hardly notice I went out of the lines. Once it was complete I ran it through my Big Shot with the "swiss dot" folder. This is so super sweet Liz!!! Love the added strawberries to the bag! OMG Miss Liz your Treat Bag is Gorgeous....You definitely did a super outstanding stamping & coloring job....it's Gorgeous!! 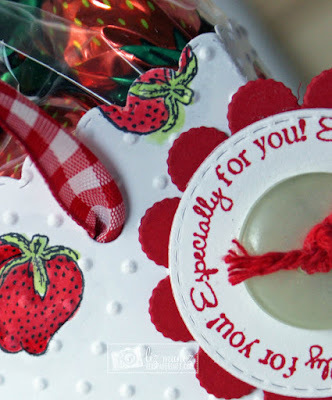 Love the embossing folder you used and your ribbon...WOW girl love all your creative ideas using Miss Emma's goodies. YOU so ROCK!! So sweet, Liz! This little bag would make anybody's day! Super cute strawberry bag Liz! Love how you added the gingham ribbon. I love the sweet colored strawberries and the Swiss Dots are so cute on it. Great ribbons and I like the large button. I bet those strawberry candies are very yummy...someone will be lucky to get this treat. Liz ~ Oh my word this is DARLING!! I love that you used that strawberry to create your own little stylist bag then fill it with the PERFECT treats ~ so CUUUUTE! This is so cute. I wAs looking for a strawberry stamp. I have this set. I love all of the DT inspiration. It also reminds me of what I have. 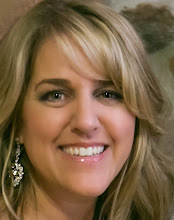 Newton's Nook Designs ~ fin-tastic birthday! 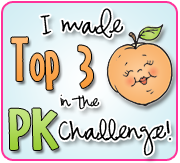 Newton's Nook Designs ~ starfish wishes! 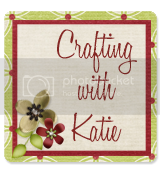 MCT August Release Blog Hop ~ boo! MCT August Sneak Peek Day 3 ~ hey there! MCT August Sneak Peek Day 1 ~ fangtastic! MCT Trending Now: Emboss It ~ drop you a line! MCT Scrapping The Little Things ~ flip flop day! MCT What A Treat ~ sweet baby!